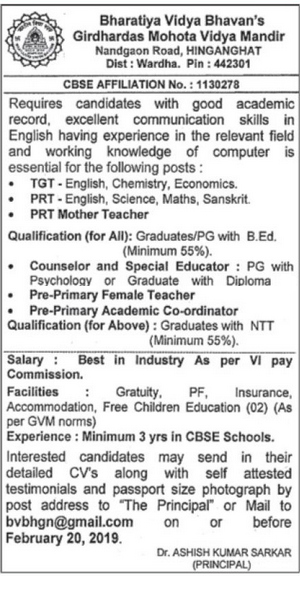 Bharatiya Vidya Bhavan’s Wardha (Bharatiya Vidya Bhavan Maharashtra), Maharashtra published a new job notification for TGT, PRT, Counselor & Special Educator, Pre – Primary Female Teacher & Pre – Primary Academic Coordinator Posts. The willing candidates are informed to see the latest notification February 2019. Qualification required Graduate/ PG with B.Ed/ Graduate with NTT/PG and More. Last Date of offline application is 20-02-2019. For More details of Bharatiya Vidya Bhavan’s Wardha Recruitment 2019 Read Below. Education Qualification: Graduate/ PG with B.Ed/ Graduate with NTT/PG and More. For Post wise Education Details follow the detailed advertisement. Interested & Eligible candidates can send their application along with all the necessary documents and testimonials to Principal, Bhartiya Vidya Bhavan’s Girdhardas Mohota Vidya Mandir, Nandgaon, Road, Hinganghat, Wardha. Application starts offline 11-02-2019. Last Date of application is 20-02-2019. Bharatiya Vidya Bhavans Wardha (Girdhardas Mohta Mandir Wardha), Wardha published a new job notification for TGT, PRT, Counselor, Pre-Primary Female Teachers, Pre-Primary Acedemic Co-ordinator Posts. The willing candidates are informed to see the latest notification February 2019. Last Date of offline application is 15-02-2019. For More details of Bharatiya Vidya Bhavans Wardha Recruitment 2019 Read Below. Interested & Eligible candidates can send their application along with all the necessary documents and testimonials to The Principal, Bharatiya Vidya Bhavan’s Girdhardas Mohota Vidya Mandir Nandgaon Road, HINGANGHAT, DIST Wardha. Application starts offline 04-02-2019. Last Date of application is 15-02-2019.